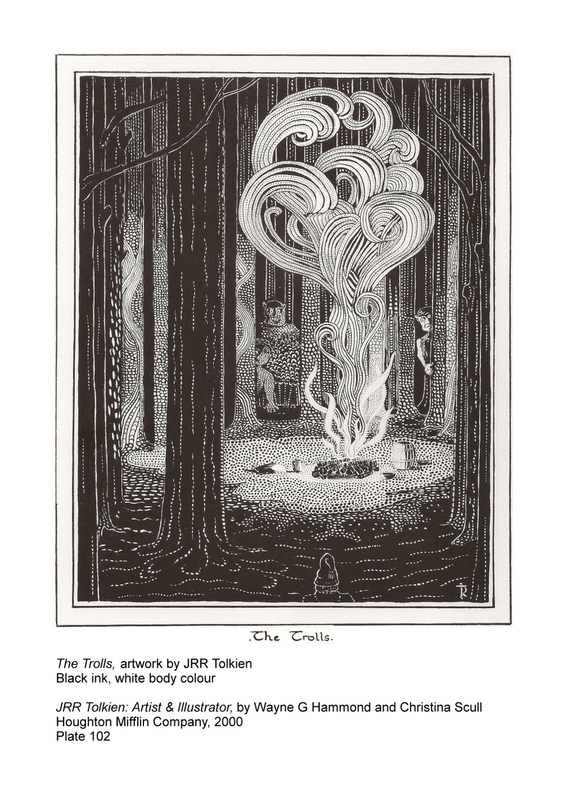 The Trolls, by JRR Tolkien. 'Mutton yesterday, mutton today, and blimey, if it don't look like mutton again tomorrer,' said one of the trolls. 'Never a blinking bit of manflesh have we had for long enough,' said a second. 'What the 'ell William was a-thinkin' of to bring us into these parts at all, beats me — and the drink runnin' short, what's more,' he said jogging the elbow of William, who was taking a pull at his jug. William choked. 'Shut yer mouth!' he said as soon as he could. 'Yer can't expect folk to stop here for ever just to be et by you and Bert. You've et a village and a half between yer, since we come down from the mountains. 2 How much more d'yer want? And time's been up our way, when yer'd have said "thank yer Bill" for a nice bit o' fat valley mutton like what this is.' He took a big bite off a sheep's leg he was toasting, and wiped his lips on his sleeve. 'Dawn take you all, and be stone to you!' said a voice that sounded like William's. But it wasn't. For just at that moment the light came over the hill, and there was a mighty twitter in the branches. William never spoke for he stood turned to stone as he stooped; and Bert and Tom were stuck like rocks as they looked at him. And there they stand to this day, all alone, unless the birds perch on them; for trolls, as you probably know, must be underground before dawn, or they go back to the stuff of the mountains they are made of, and never move again. That is what had happened to Bert and Tom and William. 'Excellent!' said Gandalf, as he stepped from behind a tree, and helped Bilbo to climb down out of a thorn-bush.... It was the wizard's voice that had kept the trolls bickering and quarrelling, until the light came and made an end of them. 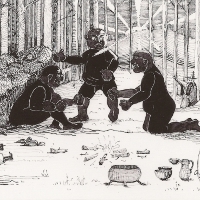 They halted suddenly on the edge, and peered through the tree-trunks, holding their breath. There stood the trolls: three large trolls. One was stooping, and the other two stood staring at him. Strider walked forward unconcernedly. 'Get up, old stone!' 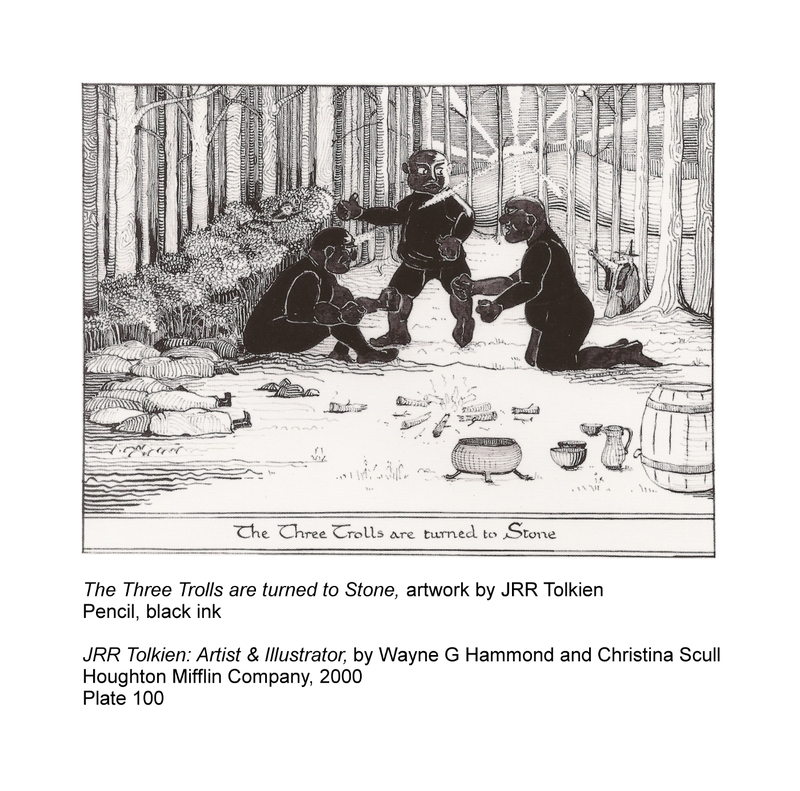 he said, and broke his stick upon the stooping troll. 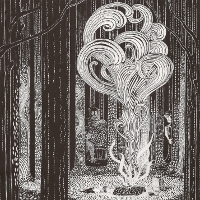 1 [In] Appendix F of The Lord of the Rings, Tolkien mentions as a type of troll the Stone-trolls of the Westlands, who spoke a debased form of Common Speech, and this description certainly applies to Bert, Tom, and William Huggins.